without my son (who's no longer a Boy Scout). This might sound like I'd have an easier time but there's the same amount of paperwork, travel preparation and organizing no matter who is there. Having fewer troop members may be a little easier, mainly on the lower number of interpersonal conflicts that could arise. This year we had 3 Scouts who are 17, meaning this will be their last camp as youth. Each of them have few merit badges left to complete before qualifying for Eagle Scout. 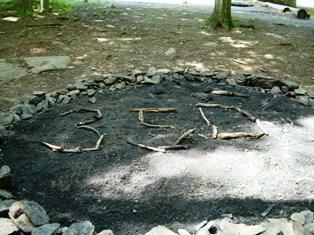 Scout camps usually have group goals in additions to individual goals of advancements, merit badges, certifications. During years when we have troop members that rush through (or skip) merit badge classes, we'll encourage them to work on group projects, rather than sit around chatting or complaining. They can do that at home and don't need me to hear and see it. But this year the group was rather small and the group goals were going to be difficult due to the range of ages and activities all were doing (the camp calls this ages and stages). Ockanickon offers clean camp award, patrol and troop recognition for completion of tasks lists. We kept a clean camp as a result of our Leave No Trace awareness level and earned that award with little extra effort. The camp ran a one hour introduction to Leave No Trace on Tuesday night; we didn't know it was geared for adults and brought a couple troop members with us. They reviewed the seven principles. While I struggled to follow some of the logic that was offered behind the principles, I thought the example that the youth leader gave about burying a chocolate bar beneath a fire to demonstrate how not to impact the ground was one with easy to verify results. The next day, our Senior Patrol Leader, with my encouragement, asked for a camp improvement project for our troop, and we were given the task of dispersing ashes from a large fire pit. The first picture shows what it looked like before we started. It may be hard to tell from this angle, but ashes were about 1 foot deep, in a circle over 6 feet in diameter. We gathered a pick mattock, shovels (properly called spoons for this work), rakes and gloves from our stock and from the camp quartermaster. 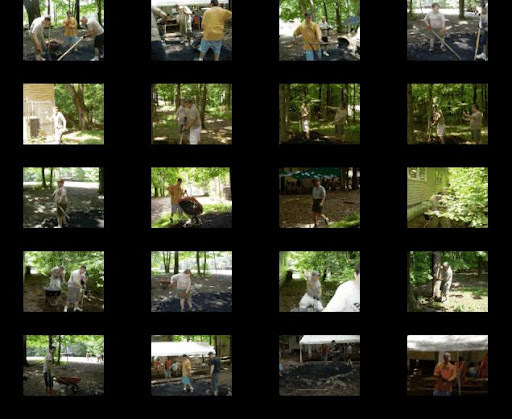 The second photo is a montage showing our scouts and Scoutmaster at work, as well as the area director stopping by for inspection. The third photo shows the finished product, with stones restored to more of a barrier, a lowered ash level, and our trademark troop number. I would have liked to shrink the circle farther to encourage smaller fires, but our Senior Patrol Leader decided we would leave it as it was. The camp can fairly easily move the rocks closer together in the future. 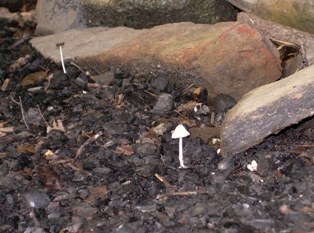 The fourth photo shows a mushroom growing in the firepit at our camp site. 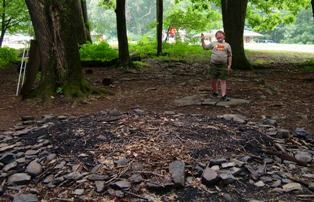 We shared a site with a larger troop, who built a campfire on several nights, but we did not have one all week. A couple nights we lit 2 citronella candles, which made a nice glow beneath our large canopy. Otherwise, there wasn't a need for fire: it rained a few nights; it was summertime so it was hot; and, we were just too busy doing things to sit around. I shot this next photo through the floorboards of my tent platform, and did a short photo blog when I spotted it. You can also see parts of a hanger, and possibly a carabiner, all of which I pulled out from under with help from a couple spotters and a rake. 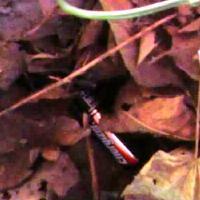 The last photo is a battery I found at the "card players" table outside the camp trading post. I started to write last night, after I picked up pizza for the troop, but they came back sooner than expected. Phone battery is low. See http://www.kwahadi.com For more. Sunday night checkin to summer camp at Ockanickon went smoothly, only a few hiccups with wasted motion going from one station to the next. At the leaders meeting in the evening the camp leadership announced an impending lightning storm so we spent an hour or so in Handicraft singing camp songs, drinking water and waiting. Today after lunch I looked under my tnt floorboards and found some good recycled treasures. 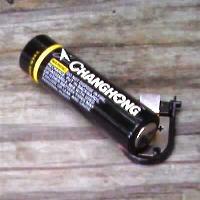 The photo shows a carabiner and a AAA battery. With the help of a couple spotters and a fire rake I scraped out these and some pens, a couple hangers, 25 cents and other trash. I'll test the battery when I get home. It may have a few milliwatts to go. And a Scout gave me 2 'dead' batteries so the count is 3 as of Monday, just about 24 hours after arrival. My phone takes low resolution, 15-second clips that save in a format that QuickTime can view, and I've uploaded snippets from the ArrowCorps5 service project to YouTube. Although they had audio, the transfer process seems to lose the sound track. Thursday I came home to bad news - a burst water pipe beneath the kitchen sink had caused a minor flood which cascaded to the family room, and the wet towels used for cleanup had not done the dryer much good. I called a family friend who is also a plumber, and he made short work out of replacing the damaged supply line with new material. One problem solved. The dryer started back up with some well placed thumps. However, the cabinet beneath the sink had previously been damaged by a dripping faucet (swelling of the composite wood base and then an elbow sized hole from that repair). So my friend suggested "while you have everything out replace the damaged material". Easy to say, harder to do, since the cabinet was built with the base, then installed, then piped and plumbed, then a dishwasher and disposall added. So I bit the bullet. Saturday morning I cut away the warped board, the ribs that formerly supported it, and other soaked fiberboard (first 7 photos). 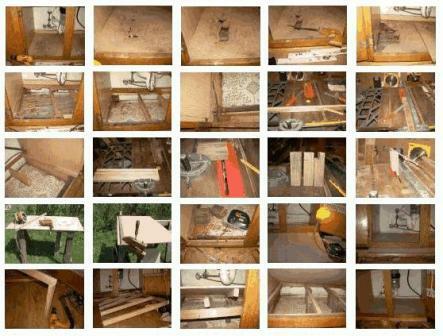 I looked at what was left and realized I needed plywood or what we used to call Masonite, and a new framework to support it. Saturday night after a few hours in the woods at the lodge picnic I was home by 6PM with a 2x4 foot sheet of "MDP" - medium density particle board, but was not alert enough to run power tools safely. I could have tried it, but it seemed safer to wait until morning. Shot # 8 shows a keyhole saw being used to remove a small piece of oak that sat where I needed to new frame to be. Sunday morning I select a few "scrap" pieces of "one-by" lumber from the shed; wood left over from other projects, or from furniture that I had torn apart (an old couch and an old porch glider), keeping the sound material. Shots 9-11 show the cross cuts and rips to make the "carcass" that would support the new floor. As the sides of the cabinet frame are suspect fiberboard, I decided it was unwise to have the carcass from the sides, so I needed some feet. With a large supply of old treated lumber (ex-backyard play set struts), I sliced 6 chunks of 2x4 into piers to support the bridgework of the carcass (shots 14 and 15). Panel cutting is a pain, particularly when the frame is fixed in place, with existing pipe and wires running through; not to mention a center upright that the 2 doors close against. I set up a pair of saw-horses, inherited from my father, who inherited them from his father. Norm Abrams would do this in his workshop, with a panel cutter he built. But I just clamp a piece of 1x2 on the panel and zip through with a circular saw. In the end, this worked nearly perfectly, except that the target area wasn't square so I ended up with a good fit on one side and a rather tight squeeze on the other. Shots 16 and 17 show the panel cutting. 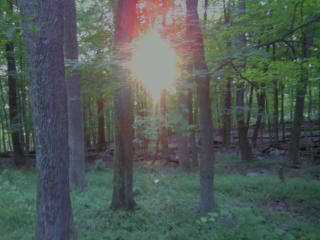 It was the best part of the work, since I was outside on a beautiful summer day. The remainder of Sunday morning was assembling the ribs and spine of the carcass, cutting away part of the old baseboard to be able to slide the fiberboard into position (shot 18), and putting a few nails into select positions to keep the assembly snug. In the end, it is bowed up about one-eighth inch in the middle above where I wanted it, but the level shows me how much better this really is now than it was yesterday morning. See http://jspath55.blogspot.com/2008/03/shed-renovation.html for another construction/renovation project of mine. 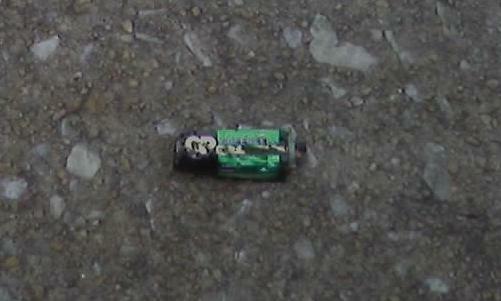 Oh, almost forgot; I found a dead battery on the Home Depot parking lot -- north side, near the outdoor fence part storage. Hiked to a convenience store for lunch (1 mile each direction, 30 minute round trip) Wednesday and found this object. The label says "GREENCELL EXTRA HEAVY DUTY 0% MERCURY". "Warning: May explode or leak if recharged, disposed of in fire or dissected." "15G R6 Size AA 1.5V Product of Gold Peak Group"
Although I was born in the 1950s, my earliest memories are from the 1960s, including hearing about a black bear cub rescued from a forest fire and nicknamed Smokey The Bear. The same era of Disneyland, and the Disney on TV, with mock documentaries about the future, such as the traveling road paver machines that went through virgin timber, leaving macadam in their path. Superhighways were to be our legacy. Fast forward to the end of the 1960's, the "death of the hippies", Chicago, Altamont, and the light of the first Earth Day. I was inspired by idealism of peace activists, the Catonsville 9 in a Baltimore suburb, the counterculture movement rejecting traditional concepts. In high school, I decided to take my math and science skills and put them to use as an environmental engineer. Fortunately, I was accepted into college and earned a 4 year degree that enabled me to do what? Become a "sanitary engineer" and then a "public health engineer," fancy names for an environmental professional. A defining moment came on a short walk in the woods of New Jersey with a college friend, where I carelessly dropped a food wrapper and got a stare, and then recognition that all the woods are my back yard, not just the ones near my house, or ones labeled state or national park. Colin, if you read this, thanks very much! Skip ahead to the late 1980s, now married, with an infant son, living in an urban neighborhood in Baltimore City. We became involved with the community organization, because our friends were already there. The City published announcements that they wanted to start recycling, and wanted neighborhood groups to run local collection stations. Kathy and I worked on a proposal to obtain one of 10 "roll-offs" for Belair-Edison, then patiently waited for the governmental wheels to turn. Maybe not as much patience as others, but we were rewarded, so to speak, with the responsibility of managing the site, volunteer workers, and publishing news, rules, and reports. For over 1 year, we collaborated with people of all ages to make recycling work. After the City began curbside pickup, we found ourselves with a lot more free weekends! Jump ahead to the late 1990s, with our son grown up and joining Cub Scouts, and then Boy Scouts in our current neighborhood in Baltimore County. I began to learn about the requirements in the Boy Scout handbook, finding the sections on waste disposal (the slightly misnamed "cat hole" for example) familiar. Teaching young men how to behave in the woods became an unanticipated challenge, such as the strident debate on the merits of building portable toilet shelter in the campgrounds behind our host church. I steered the educational path along the Leave No Trace guidelines in the Scout manual, reasoning that quoting authority is a better approach then "because I said so". During a merit badge weekend in 2002, I learned more formally about the Leave No Trace program, when another adult led an all-day training session, complete with cooking tips and sharing of food. I liked the patch, I liked the idea, and unlike a lot of other BSA awards, I could earn this one as an adult. I needed to complete specific requirements, of which the most challenging turned out to be assisting 3 troop members to earn the award. By the Troop Court of Honor in December 2003, 4 Scouts had completed their LNT programs, so I earned the patch along with them. 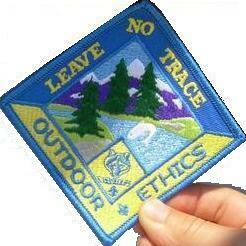 As of today, 3 others in the troop, including my son, met the BSA Leave No Trace requirements. During out 8 to 10 camping trips each year, we put the principles into practice, bringing home others' trash, recyclables and often working on service projects. 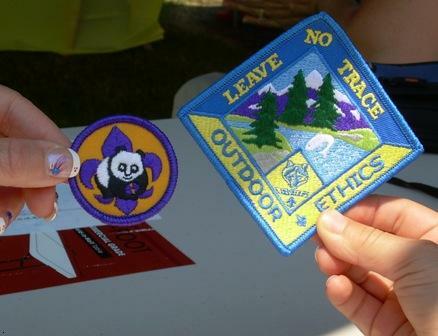 Details of the troop awards are online at www.editgrid.com/user/jspath55/LEAVE-NO-TRACE-BSA-TROOP-350. Somewhere in this timeframe, I visited the LNT.org website and joined as a member. After seeing the bigger picture, I started to gift memberships to those Scouts who earned the LNT patch. One in particular wears his Leave No Trace member T-shirt whenever possible, so much he's probably in need of a replacement! In 2005, I recognized that LNT is a non-profit eligible for donations from my company's (Black & Decker) matching gifts program. From then on, whenever I renew my membership or award a membership to another, I do the paperwork to increase my impact. Early in 2008, I corresponded with colleagues at SAP (a large software firm based in Germany) about social responsibility, focusing on small steps such as reducing disposable water bottle use at large conference settings. I had a brain storm to increase Leave No Trace awareness by offering a free reusable water bottle to those who cared. I intended to give away 5 memberships, but didn't reach that goal. I was able to give away a few and plan to try this scheme again. I wasn't thinking of AC5 as a Leave No Trace project, as it initially seemed to be about trail building and trail maintenance, with the aim of encouraging national forest visitation. But as I went through the squad leader training weekend, and observed the participant training on Sunday before the crews went out into the forest, I realized that LNT principles are an integral part of the planning and execution of trail projects. 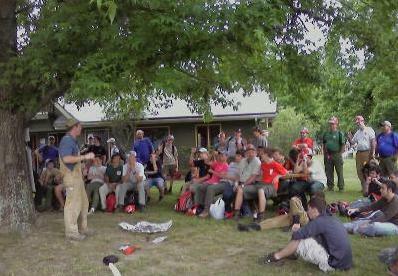 Just having several hundred youth and adults working on National Forest property was a challenge. and you know what? I didn't find any trash in our project areas. 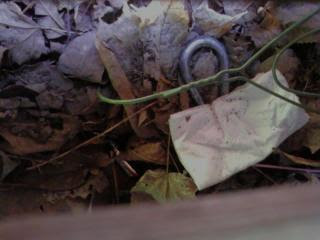 The only thing I came back to camp with were a few nylon trail marker ribbons that had come off their locations. As I reflected on the project goals, I decided one legacy I could leave was more memberships. I've decided to give my team the same opportunity I've given the Scouts in my local troop. Now I'm just waiting for them to get back to me with their choice of water bottle or T-shirt. On many camping trips, the camaraderie around a campfire is the highlight of the evening, with stories, jokes, and songs shared that might be recalled for a lifetime. The opening and closing shows of summer camp, lodge events and huge operations such as ArrowCorps5 are no exception, with the slight modern adjustment of the flicker of digital images replacing the flicker of hydrocarbon combustion. But by no means was the gathering of Arrowmen merely an opportunity for all to communally watch movies, as if we all had shown up at a mall theater (or perhaps the Bengies drive-in) in full Class A uniform, with sashes. But even before the opening show, I participated in several gatherings. The first was Conservation USA training, where experienced trail crews from Philmont shared knowledge of project management, water conservation and safety, safety, safety for all crew. At our lunch break Saturday, we met our 2 mascots for the weekend, Smokey Bear and Woodsy Owl. 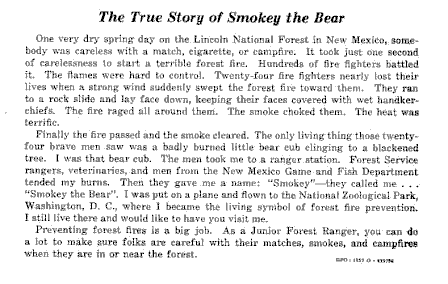 I remember when the former was known as “Smokey The Bear” back in the 1960s on television commercials teaching youth and adults to “Always Be Careful with fire. Before we knew it, both the Owl and the Bear were given Ordeal honors, each donning brand-new sashes they would wear the remainder of the week. It was a brilliant idea, melding the United States Forest Service media representatives into the Order of the Arrow lodges. We cheered as each was presented to the crowd. Around 7:30 PM Saturday night, the crowd gathered at Camp Post near the main registration area, in view of Lake Merriweather, the lake that the camps of Goshen Scout Reservation share for merit badges and recreation. Late arrivals continued to pick up badges, goodie bags and training material for the days to follow. During the afternoon, I had decamped from Camp Olmsted en route to my longer-term home at Camp PMI. Before the formal show, members of the “elite” Instructor Corps entertained us with country/bluegrass stylings. Seems that musical talent was just one aspect of the “I-Corps.” The formal show included introductions of the youth and adult OA leaders, Forest Service project staff and video clips from those unable to attend. On Friday, Saturday and Sunday, I met my fellow AC5 staff, including squad leaders like myself, support staff (cooks, commissioners, and public relations, to name but a few) and the “experts from out of town” the 42-strong contingent of Philmont trail crew experts selected to work all 5 of the service projects. They had been selected for their skills not just in handling shovels (called “spoons” here), Pulaskis and McLeods, but for leadership skills. Each was assigned 2 squads, so I was working for a youth younger than my son. The training continued what some had started at NCLS (National Conservation Leadership School) but I was able to fast track completion thanks to my environmental engineering background. It took me a while to find Jake, my crew leader, given the size of the crowd and number of activities going on, but by Sunday we were able to begin organizing for the week. The closing show on Friday night proved to be the first time that I-Corps had been able to stay, as the schedules for Manti-La Sal and Mark Twain required them to depart beforehand. Thus, they were able to hand out packets containing crew photos, patches and related memorabilia. My squad sat with Jake in the front row; I played the “old guy” card and sat further back in a folding chair. To say this event was well-prepared and structured for brotherhood would be an understatement. Each participant was given a booklet with ample inspirational quotes, guidance, resources and suggestions. One of my favorites was the blank area for autographs, and a suggested goal of 20 signatures, to be collected on your recreation day (I have 30, including National Chief Jake Wellman, the National Chairman, and the Youth Incident Commander Geoff Landau). Another suggested goal was to introduce yourself to someone you've never met. Well, a 1 hour 15 minute bus ride from base camp to work site gave ample opportunity to share stories with brothers you've never met, and may never meet again, and to gain perspective into many lodge operations. A final word on brotherhood moments – we were supplied with trail lunches, a wonderful feast we picked up during our morning bus departures. Each day, we ate together either at the trailhead, or along the trail. Thursday's was particularly memorable, as Brad Haddock, Carey Miller and Jack Butler of the National Order of the Arrow organization, worked with our crew and then shared lunchtime with us. Jonathan (of O-Shot-Caw lodge 265) led us in grace. During the week we worked to avoid dehydration, with brothers sharing water among those in need. Of course, who could be cheerier than Woodsy Owl (“Give a Hoot, Don't Pollute!”), who seems a friendlier character than Smokey Bear. We were given stickers in our welcome packets, including both Woodsy and Smokey, which many affixed to our red safety helmets. A few lodges came prepared with their own stickers, which they gladly shared around. Squad leaders were given sheets of decals to be handed to those doing “good jobs” (anyone who has seen the movie “Hancock” will appreciate this sentiment). Tuesday was another challenging day on the trail, and afterwards, as our bus headed in the opposite direction from camp and dinner, to a “meet the press' event. Allegheny Highlands Chamber of Commerce, the town of Covington, and representatives from the OA and the Forest Service expressed their gratitude for our service. After hearing one speaker say he had never heard of the OA before this project, but he sure knew us now, one of the highlights was the announcement from a town manager that she had been inducted as an Ordeal member this year, and knew well the potential of a group of Arrowmen. This elicited a round of applause. Afterward, we were presented with cold watermelon and drinks. The challenge of occupying and operating a camp with hundreds of participants requiring food, shelter, water and trading post access fell to a combined task force from OA National HQ and from the camp owners, the National Capital Area Council. The photo of Bob Owen, head Commissioner, at one of the bus departure mornings, is a priceless moment of the cheerfulness required for a project of this magnitude to succeed. Bob's commissioners gave out “Goshen Gopher Happy Camper” awards to those exemplifying Scout spirit in making camp a happy place to be. I am pleased to report that my squad earned several of these limited edition (not-for-sale) patches, including a few earned when I volunteered them in absentia to clean half the shower house. Those who showed up, pitched in, and got the job done without complaints showed their ability to do a good deed. Since I returned from AC5, I've been looking online for news, photos and videos of ArrowCorps5. There is an official video on YouTube (verify link: http://youtube.com/?v=NCgov1vYtwo ) which should be available in higher resolution as part of the AC5 DVD. A friend of mine runs an event tracking web site, so be sure to visit http://i.eventtrack.info/?et=arrowcorps5 to view project images. By definition, ArrowCorps5 is a service project like no other, so it almost goes without saying that each site delivered a week of service to our nation's natural resource conservation efforts. But if all we accomplished was a massive Eagle project at 5 places around the country, that would not be sufficient return on the investment of time, people, money and other resources we've dedicated to this effort. It would be a great return, but we intended to deliver more. I think the closing show speech from a Forest Service administrator sums up what we accomplished. Speaking from the perspective of an inside-the-Beltway career federal employee, she related her original skepticism that this project would amount to much. It seemed too ambitious for a volunteer group to succeed in a week producing what would have taken paid contractor months or years to complete. I heard similar feedback from others, who had the initial impression that 1,000 Cub Scouts would appear in the National Forest, full of enthusiasm, but short on stamina. We certainly fooled them! I've heard different statistics on how much trail we were expected to complete, how much we might have completed, and how much we did complete, but the undeniable quote from the Forest Service administrator was that we not only completed one part of the project, building durable surfaces for camp sites, but she planned to have the sites open for business the next day! Others told similar tales of how much more we achieved than had been hoped, including the two prior sites. A primary goal of the projects, just like Eagle Scout Leadership Service Projects, is team and leadership skills. I saw firsthand how the young men of I-Corps (also known as the “A team”, the “Iron Men”, “Strike Force” and similar accolades) tackled daunting organizational, administrative and logistical obstacles. While not every battle could be considered a complete success (nature fought back Friday with a noon thunderstorm), every faltered step was bolstered by learning and coaching. The ideas of Leave No Trace, Safety, Conservation and Legacy were reinforced time and again during the week. What am I returning with for Nentico Lodge? Firstly, while I started on my journey believing I was the sole Lodge 12 representative, it turned out that a Florida lodge member (Sam) had relocated to Howard County recently, so I was not alone. Secondly, I have patches and memorabilia for our lodge museum. Thirdly, I have a fuller appreciation of the skills required to manage a project of this magnitude. Fourthly, I have tales to tell at Lodge and Chapter meetings, that I've practiced sharing already. Last, and definitely not least, I have ideas and inspirations for future service projects. Seeing expert trail crews at work, teaching neophytes the skills required to build and maintain pathways through beautiful forests has given me new appreciation of what pioneers have done. Different crews used different techniques, some more invasive than others, leaving a variety of impressions for National Forest visitors. I'd like to serve as adviser to trail crews at the Lodge and Chapter level, where our expertise in conservation can be leveraged not only for Unit and Eagle projects around Scout properties, but extending to local, county, state and national parks. Continuing the legacy of ArrowCorps5 is my goal. 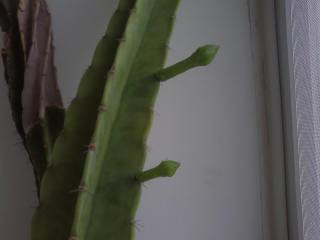 Sitting in my living room, eating lunch, happened to glance out the window, not at the distance, but at the forgeround where 2 cactus proto-flowers have started. I have had these plants since around 1984 and they've only bloomed a handful of time, within the past few years sitting in full sun. While the stalks look ill and barely alive, today's double shoot discovery is evidence of vitality. I've missed a couple blooms, only finding the flowers after they've opened, closed and fallen off in pencil-stub size gray cylinders. Still a bunch of photos upload, notes to transcribe, and conclusions to draw about ArrowCorps5, but here's a recap using the editgrid.com online spreadsheet tool. Thanks to Gil Rogers for photos I found of his on Picasa.